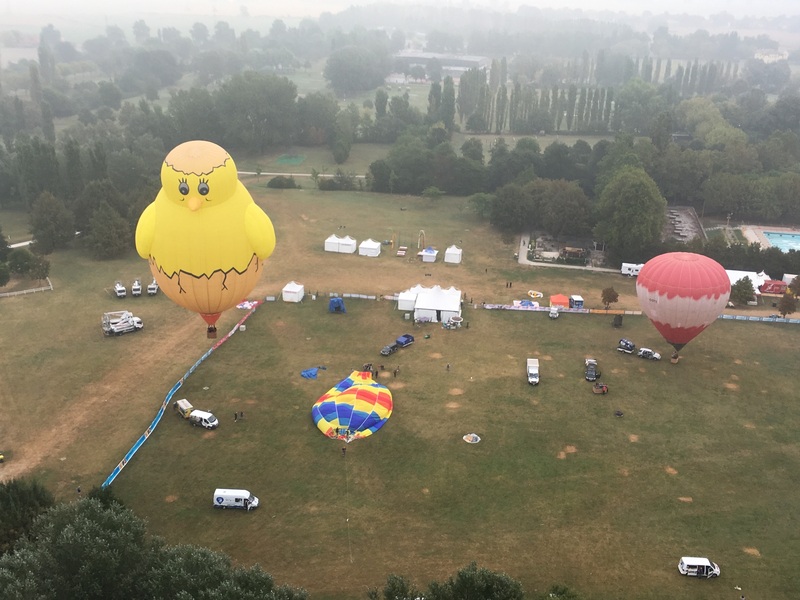 Home › Ballooning › Balloon Meets › From Warstein to Ferrara – by van!!!! Having toughed it out in Warstein Neil Iveson filled his rucksack with beer and set off to march over the Alps to Ferrara from where he wired us this report. 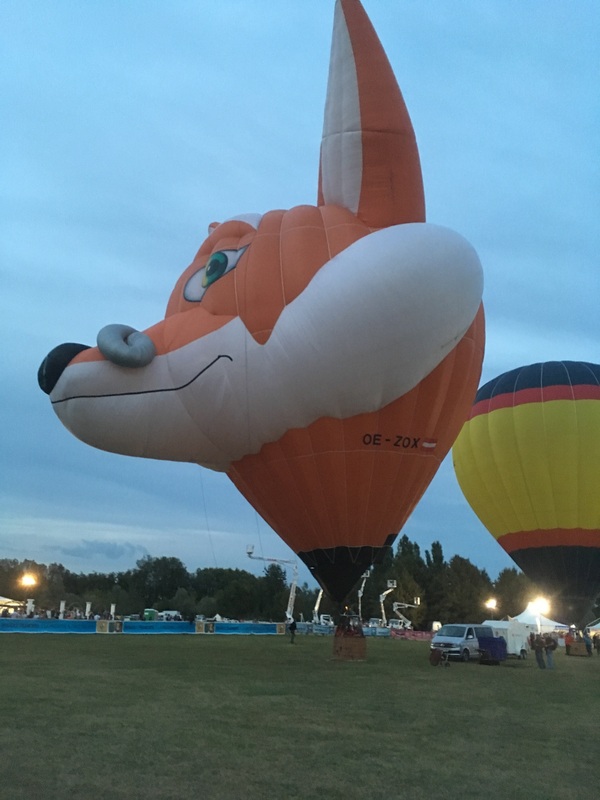 Ferrara Balloon Festival in Northern Italy ran from 10th to 18th September. Due to the first weekend clashing with the German Warstein Meet Team Khaos, consisting of Andy Kaye, Gaby Gruenauer, Andy Austin and myself only managed to attend from the 14th to the 20th September. We were there with Andy Kaye’s recently acquired Ultramagic Football, built originally for a Belgium cable channel, VT4. Initial launch of the channel coincided with the Euro 2008 championship, hence the football shape being chosen. Between Warstein and Ferrara Andy Kaye, Gaby and I, enjoyed a few days downtime in Schwabisch Hall with the plan of Andy Austin flying out to Germany on the Wednesday where we’d meet him at an airport on route. Our drive down took us though the Alps starting in Southern Germany, through Austria and finally over the Italian Alps. This was the first time I’d had the chance to drive the route in summer months and it proved to be a stunning drive. As we approached the Alps in the distance we could see the hills starting to get bigger until finally we were in proper mountains and valleys bathed in sunshine. As per the week in Warstein, Germany was still sweltering in 30 plus degrees and windless, clear blue, skies. Passing between Germany and Austria we drove the spectacular Ferne Pass which takes you past a mountain known as Zugspitz and at 9,718 feet it is the highest peak in Germany. We drove on past Innsbruck and into Italy finally arriving in Ferrara early evening. Next morning at the hotel we met up with the organiser Paulo Babiere. As ever with paperwork sent in advance and Italian meets being relaxed, a quick hello and a handshake was all that constituted check in. There were a number of shapes present including a chicken from the Netherlands, “Arky” the Noah’s ark originally from USA which now lives in Germany, a Fox and the Orient Express, both also from Germany. There were also the usual round balloons but not as many as seen in previous years. Unfortunately the few days we were there would not see much in the way of flying for us. The majority of the evenings were hot so local thunderstorms cancelled any chance of flying. Most mornings were generally wet and gloomy and although some did fly we decided to give most of them a miss. The flights we did get were good fun. On the Friday morning we ventured down to the launch site with high hopes of flying but we were met with a gloomy sky nevertheless the met balloons showed it legal with a light breeze taking us to the south west cutting across the top corner of the city. Andy Kaye declared he would retrieve and wanted Andy, Gaby and myself to fly. We inflated the football and waited for Paulo to take off in his 250. For some reason we decided it would be a good idea to follow Paulo, well he’d been flying all week and knew a sensible track to fly? That plan went out the window after about 15 minutes. At around 1500ft we started to get some low cloud drifting in and the visibility reduced. This meant following wasn’t the smartest idea so we abandoned the idea and descended to find better conditions. In changing heights we inevitably went in a slightly different direction but, as often is the case, sometimes it is better to do your own thing. The lower level wind was typical for Ferrara, basically not much of it and not predictable in any direction. Crossing and clearing the railway line to the west of the city allowed us to descend and see about possibly landing on a grass wasteland area. As half expected we got within 100 metres of the fields and took a 90 degree turn to the left. We now had a very slow track parallel to the railway which wasn’t too bad as we could see a another large grass field not too far away. Andy Kaye appeared below us in the van and radioed that it was just starting to spit with rain, probably explaining the sudden direction change. Next to where he had stopped the van was a court yard, so with the owners permission the handling line was thrown and Andy guided us into the yard. We were just about packed away when it started to rain again. The balloon got a little damp but we were much more fortunate than a couple of other balloons who were now flying in the rain over the city with few landing options! The only other flight we managed was on Saturday night followed by a Night Glow. The evening flight wasn’t an ideal direction as it went straight to the petrochemical works that runs down the north side of the City! It’s about a mile in length and a half a mile across. We took off and kept low hoping to skim past the southern edge of the plant on a track which took us to a good area for landing. 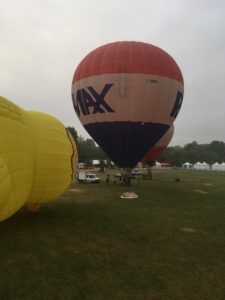 We were very close to making it but as we got closer we thought better of it and joined the other balloons at 2000 foot taking a 10 knot north-east track over and away from the unwelcoming works and into open countryside. From our elevated vantage point we could see the land around and there wasn’t a great amount we would really want to land on following Friday’s rain. We descended and managed to find a short cut stubble field that had a good track running alongside it. 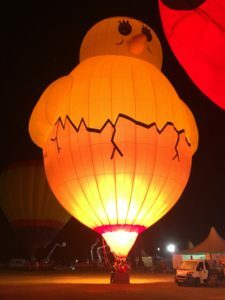 We quickly had the balloon packed away and we were heading back for the Night Glow. Nine balloons took part in the Glow with shapes including the Fox and the Chicken. A French pilot with a 250 decided to inflate his balloon then, as he didn’t have enough ballast, decided to move the balloon onto the trailer before strapping it down. Whilst it was OK in 1 knot I wasn’t convinced it was all that smart! During the days between flying slots we took the opportunity to explore Ferrara a little. Ferrara is an old walled city dating back to the Renaissance and Medieval periods which have gained it status as a UNESCO world heritage site. The town is best seen on a bike so on several occasions we hired hotel bikes and went exploring. Sights to be seen included the City wall which you can cycle most of the way round, the city centre itself, a warren of old streets housing arcades and markets and the city castle which has its oldest parts dating back to 1385. One thing we did learn was avoid green areas. Ferrara is renowned for its Mosquitoes. Anything green indicates moisture and is a popular hiding ground for them. When cycling round the city shaded areas are often seen with a vast cloud of mosquitoes hiding in the shadows. The last evening of Ferrara balloon festival once again had flying cancelled due to the presence of a thunder storm off the south. As there were a number of teams hanging around we took the opportunity to inflate Paulo’s Special Shape Flying Cow HB-QGL. Paulo had acquired the Cow from Switzerland a few years before as it had been deemed porous and not flyable. After a 20 minute game of hunt the velcros we were ready to go and Andy Austin commenced inflation. 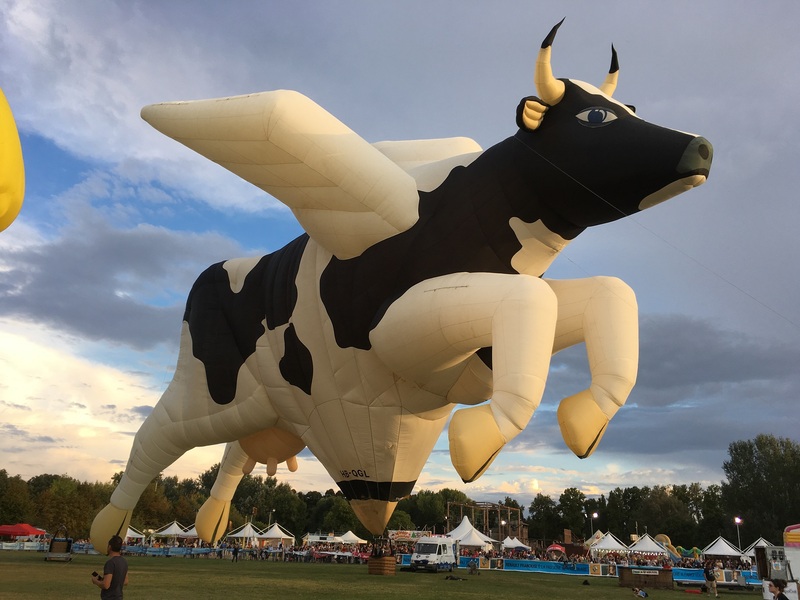 With very little effort the cow was inflated and turned out to be a solid shape even when the odd gust came though. We kept the Cow inflated for about 40 minutes as Paulo wanted it inflated alongside the Warstein Orient Express for the crowd to see. When the time came to deflate it paid to have a large team of people as with help from about 15 people from ripping out to closing the bag was about 20 minutes. Pretty impressive. That then was Ferrara. Not the most flying but a lovely place so with the farewells and goodbyes done all that remained was the long drive back to England via Schwaebisch Hall for an over night stop.